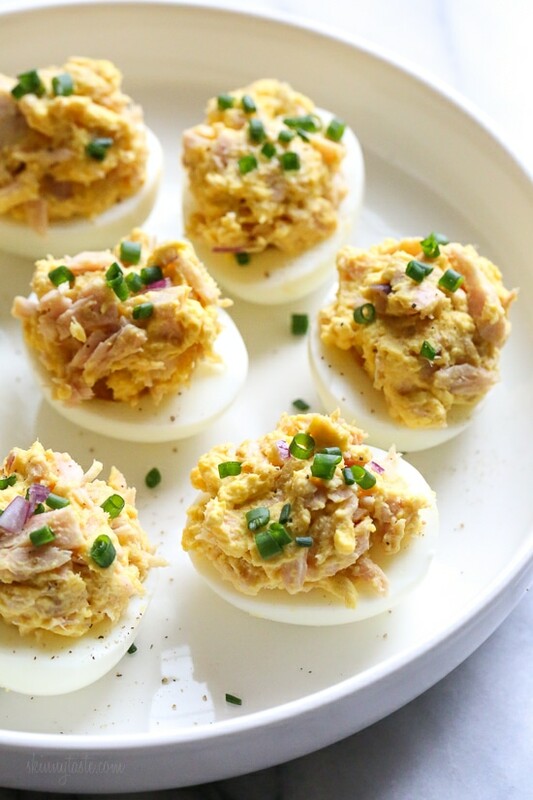 These Tuna Stuffed Deviled Eggs are perfect to pack for lunch or serve as an appetizer! I combined two favorites, classic deviled eggs and tuna salad and made these bite sized snacks, lunch or appetizers you can easily make ahead and pop right into your mouth! You may also like versions such as Instant Pot Deviled Eggs or Guacamole Deviled Eggs. Hard boiled eggs stuffed with tuna, why not!? 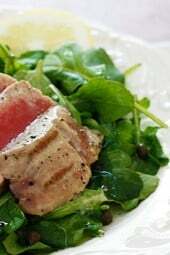 They make a great low-carb, high protein alternative to tuna sandwiches and can be made ahead for lunch on the go. They are also keto, gluten-free and whole30 if you use compliant mayo. If you want to skip the mayo altogether, you can sub the mayo for a little olive oil instead. 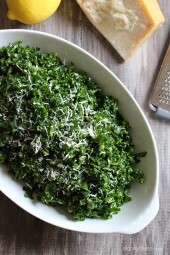 To pack for lunch, store them in an airtight container and refrigerate for up to 4 days. You can easily halve the recipe to make less servings. In a medium bowl combine the egg yolks with mayo and mash. Add tuna, red onion and red wine vinegar. 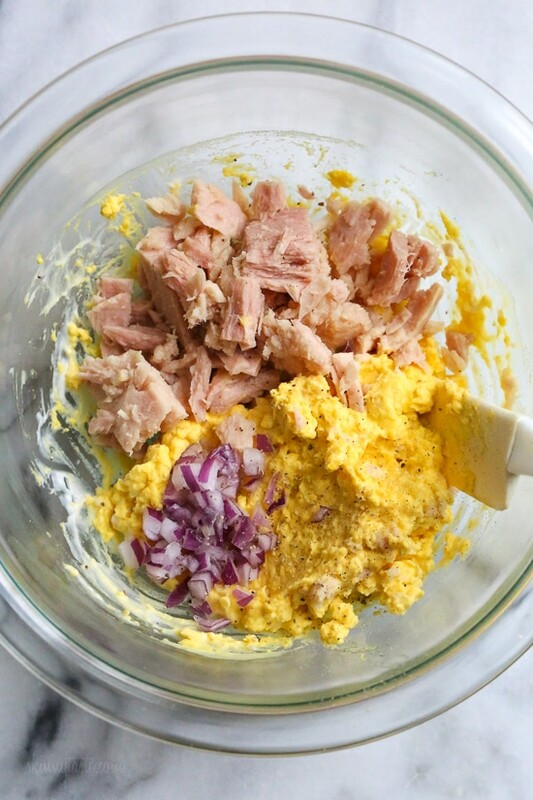 Scoop heaping spoonfuls of the tuna salad into the 16 halved eggs. Garnish with chives. I made these tonight and served with the bean, bacon, and spinach soup. I love these eggs! I love deviled eggs and tuna salad, so this was a perfect combo. I made this today for lunch and it was excellent! When u plug this into the weight Watchers calculator, it says 7 points/serving??? Do you use canned solid albacore or canned chunk albacore? These are fantastic. I am not a huge tuna can but these aren’t in your face. This is delicious!! I cut the tuna, eggs and mayo in half. If I was going to use 8 eggs I would double the vinegar and onions. I am on Weight Watchers so this is perfect!! These are also delicious with hummus instead of mayo. Delicious! And double the protein! Hi Gina, these eggs looks yummy and healthy small snacks when we crave food, thanks a lot for your healthy meal suggestions. Has anyone tried these with some mustard mixed in?? I always use mustard in my deviled eggs and wondering how that would taste with the tuna. Thanks in advance!! Thank you, Gina! Yes, that makes sense. The more I think about it, tuna salad is just mayo, so makes sense not to use mustard. I’m going to try these this weekend. Thanks! I absolutely LOVE every single recipe of yours that I have ever made (and I’ve made a lot of them!). Your website is the first (and really only) site that I go to when I am deciding what to make for dinner. Thank you so much for all of the wonderfully delicious recipes!!! Love, Love, Love the Tuna Salad Deviled Eggs. Super easy to make! and fulfilling! Thank you for this recipe! Will be adding to my recipe file and making it again!! I wonder how this would be if i subbed tuna for canned chicken? This sounds great! Satisfies my craving for tuna salad sandwiches without the carbs. In case anyone uses fresh eggs that are difficult to peel, we have found steaming them in a veggie steamer works great. ( we put cold tap water in the pan with the steamer Tray, cove with a lid, and begin timing immediately when we set the pan on the burner). Gina, thanks for the recipes! Could I also use a can of chicken in this recipe? I made this today. I didn’t have the vinegar so I used a little pickle relish and it was amazing. This was a great lower calorie lunch; yet high in protein. I added curry powder to this and was very tasty. Wow, thank you, Gina. Something I can have and my husband will like too. Not to mention easy. FOr 12 ounces of tuna, when I plug into my fitness pal I get quite a few more calories then you calculated. Is that 12 oz after draining? If so, I think the calorie count is off. A good tip for deviled egg lovers – serve each half in cupcake papers. They are easy to pickup individually, don’t slide around on the plate, and keep fingers clean. Brilliant idea Barbara, easy to pack in Tupperware container as well for lunch!! Thank you so much for this tip! I live in Japan and struggled to figure out how to store deviled eggs well. As you can imagine, they just slide around and even flip upside-down in regular Tupperware containers. Cupcake wrappers are relatively easy to find here, and they worked perfectly! As for the recipe itself, three stars. Just like pretty much any other recipe on this site, it’s delicious. I hope to one day be able to eat these. I’m a huge fan of deviled eggs, but recently found out eggs don’t agree with me. I was told to try again in a few months. I tried the recipe with non-fat Greek yogurt & it was wonderful. There was a little moisture the next day but was easy to dab with paper towel. In fact the next day I chopped them up, put between thin sliced whole grain bread, and had delicious sandwiches. Great recipe. It seems you started with 8 whole eggs and ended up scooping ingredients into 12 halves! I know. Fuzzy math happens to me all the time. If you use fat-free yogurt instead of mayo, you have a 0-points snack. just a note. It looks like you started with 8 whole eggs and ended with 12 halves. ??? ended with 16 halves, 4 servings, 4 each. Hi! Why are these 2 points? I would think they would be 0 or 1 point since the only thing with points value is the lite mayo. Thanks to your clever recipes and the amazing WW Freestyle program, my lunches are just amazing these days! 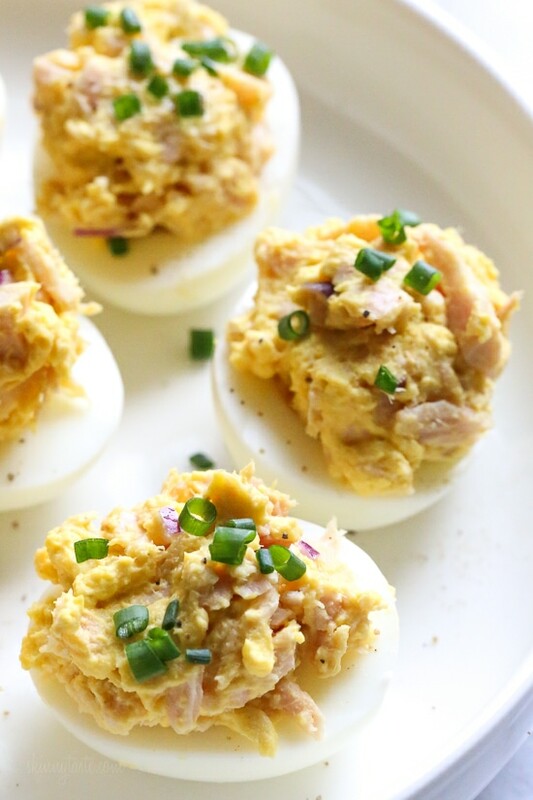 I love the idea of Tuna Deviled Eggs! Thank you. Oh, and BTW, Step 3 in the directions should say “16 halved eggs” right? GIna i love all your recipes. I am not a mayo fan so i used guac in my tuna salad instead. 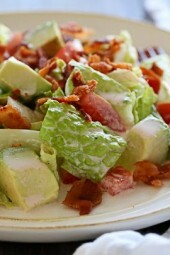 would make a great substitute and is whole 30 compliant! thank you for all your great recipes and books. you really have been a huge part of my success losing ( and keeping off) 80lbs.! Sounds wonderful! Could you please specify ‘can size’ in ounces for the tuna and in future recipes? Many of us live in Canada and our sizes are really different. Thanks! I use your recipes faithfully and recommend them to all! What size cans of tuna for the 2 cans?